This new rest from Carter Products allows you to solve the problems associated with turning vessels and forms where the workpiece is unsecured which can compromise the quality of the work and even be potentially dangerous. The rest is easily adjustable to support of all sizes of workpieces, and fits machines from mini-lathes up to those with a 510mm swing with no additional hardware required. The base attaches securely to beds with way sizes from 25-115mm in width. The MultiRest quickly adjusts to accommodate different workpiece diameters. Unlike many other commercially available steady rest devices, or those fabricated for specific work, the MultiRest is virtually infinitely adjustable for maximum support and works at any position on the lathe bed. The product features a unique two-piece design. 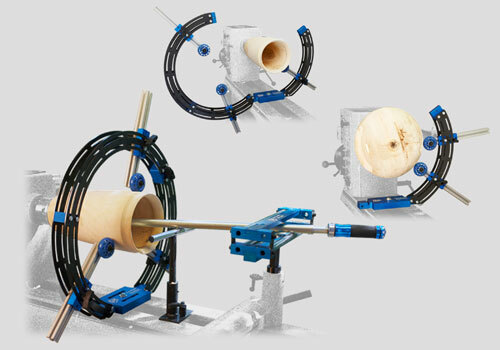 The support ring can be opened without removing the MultiRest from the lathe bed for easy mounting or removal of workpieces, or other work such as sanding. Also, by removing the large support ring section the remaining piece serves as a bowl rest for exterior shaping. Engineered and manufactured in the US, the combination of laser-cut steel and aircraft-grade aluminium results in superior rigidity while cutting its weight to less than 50% of comparable steel rests. The urethane support wheels provide maximum vibration dampening while remaining rigid and gentle on the workpiece surface.